The AppleTV "Upgrade software" button finally worked on June 20th, after three months of "Your Apple TV is up to date" messages. Pressing this button gives a seemingly long download of the new operating system (version 1.1) and an even longer reboot time. Once rebooted however, two new menu items appear. In the Settings menu, a new item "iTunes Store" lets you pick your country, however no further options nor the ability to buy Movies, Music or Videos surfaces in those menus. 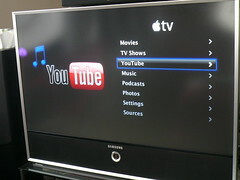 The big addition is the YouTube interface, with its logo looking just as shiny as the Apple created functions. As long as you have Internet connectivity on your Apple TV, the videos stream right into the device, no transcoding PC is required to sit in the middle, like the Netgear EVA-8000. On my HDMI connected 720P DLP TV, YouTube videos actually look OK, not as blocky as I would expect on a big screen, but the content quality of course varies by the producer. The addage "Garbage in, garbage out" still applies years after my 1987 RPG and COBOL classes. Click on the photo for a few examples of stolen (music video) and user generated (crap) content in my Apple TV HDTV Flickr stream. Watching the videos within the Apple TV Top Music Videos interface still looks the best, but these HDTV published videos are still hard to come by. You need to know that all videos on the YouTube PC interface are not available, like the quitely launched 3GPP mobile (m.youtube.com) portal. For example, searching for Ze Frank on the YouTube PC interface gives 620 results, but on the Apple TV, none are found. There will be some time before the Adobe flash content is converted for both the Apple TV compliant H.264 and mobile 3GPP codec platform. Now if only YouTube could get some compelling and legal content - anyone? I have also created a video walkthrough on the device to give you a look at the UI.